The Myvi is Perodua’s bargain priced supermini. Despite its low asking price and supermini status the Myvi provides a spacious and comfortable cabin. 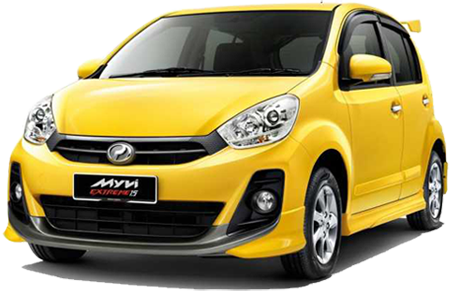 The Myvi is an economical alternative to the more costly competitors. The Myvi is Perodua’s third model to be released in the United Kingdom and the budget price and distinctive styling is likely to be appeal to a large number of buyers. The Myvi boasts an excellent build quality despite its cheap cabin materials. The Myvi should prove to be a dependable and durable car. The Myvi also boasts more cabin space than its predecessors. The Perodua Myvi is great for city driving and handles and maneuvers well. The Myvi rides and performs best when kept at a moderate speed. The Myvi’s suspension and wide stance provides a decent and comfortable ride. The Myvi provides good passenger space with head and legroom being plentiful. 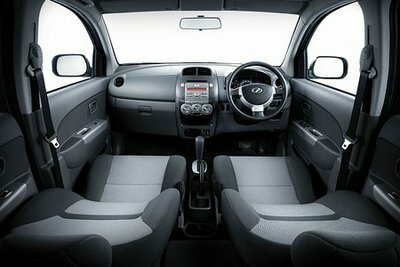 The Myvi’s cabin and boot are also easy to access with space being generous it is easy to slide into the Myvi’s seats. The Myvi provides good cabin and boot space. Rear seats provide a 60/40 split and fold system providing even more storage space. Passengers should have plenty of room for comfort on shorter trips. The Myvi boasts a simple interior layout. The Myvi’s controls and dials have a cheap look and feel but seem to be durable enough. The cabin is composed of cheap plastics but the instrumentation is functional and easy to use. The Myvi’s steering wheel and seats adjust for comfort. Most drivers and passengers shouldn’t have any trouble getting comfortable, especially with generous amounts of headroom. The Myvi is an easy car to park thanks to its power assisted steering and small size. The Myvi also provides a high drive position, excellent all-round visibility, and a tight turning circle. The Myvi delivers a good ride through town thanks to a spry engine with lots of pep and responsive steering. The Myvi delivers a decent and composed ride even on less than perfect roads. The Myvi is a supermini and an unlikely family car due to its small size. The Myvi is capable of seating five comfortably on short trips, but the boot is too small to accommodate a family of five. The Myvi would make a decent second car for a family. The Myvi would make an excellent first car. It is small and easy to maneuver and drive. The Myvi steers well and is economical to buy and run. The Myvi would make an ideal first car. Perodua sells inexpensive cars and despite the bargain cars that the Malaysian firm produces the Myvi boasts sound build quality. Perodua’s reputation outside of Malaysia is that of a bargain producer. The Myvi’s standard security features include remote central locking and an engine immobilizer. This is likely to be enough security for the Myvi but for buyers who wish to have additional security a visual deterrent may be a good idea. The Myvi’s standard safety features include front crumple zones and a body designed to absorb the impact of a crash, driver and passenger airbags and ABS. Other standard safety features include EBD and seat belt pretensioners. The Myvi’s standard audio unit includes a radio/CD player. The unit comes with four speakers and delivers decent sound quality. The basic system includes a traffic alert feature. The Myvi also comes standard with metallic paint and a choice between seven exterior colours. The interior has a cheap look and feel but should prove to be durable. The Myvi makes an excellent car for new drivers and those on a limited budget. It’s easy to drive and park and an affordable alternative to rival brands. Many buyers will opt for the more respected badges but shouldn’t eliminate the Myvi as an option without a test drive.